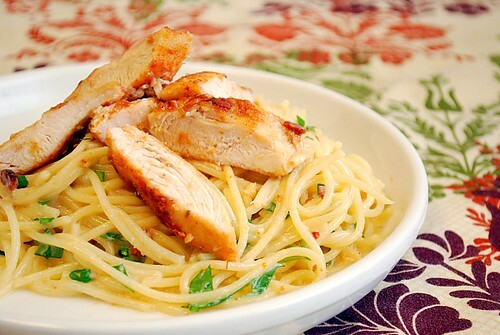 Article first published as Chicken Carbonara on Blogcritics. When you think of spaghetti, what's the first dish that comes to mind? Spaghetti &amp; meatballs? Well, that's what I used to think... until now. These days, when it comes to spaghetti, I automatically think of carbonara. Perhaps its because it's a dish that comes together much more quickly than the traditional spaghetti and meatballs , not to mention the depth of flavor it has! I recently made this Chicken Carbonara as a spin to the classic Pasta Carbonara. It's just the simple addition to sautéed chicken breast that really makes it even better. A creamy egg and cheese sauce, studded with crisp bacon and topped with chicken transformed plain old spaghetti into something elegant! Now with my son walking about and getting into everything, I'm all for dishes that are fast and easy. This dish comes together pretty quickly and if you want some additional shortcuts... use cooked crumbled bacon, shredded rotisserie chicken and Italian shredded cheese as substitutions in the recipe. I've been making this a few times because it beats making the usual spaghetti and meatballs and personally, this tastes much better, even the next day as leftovers! Heat the 2 teaspoons oil in a heavy large skillet over medium heat. Add the bacon and garlic and saute until it is brown and crisp, about 8 minutes. Remove from pan and cool slightly. Season chicken breast with salt &amp; pepper to taste. In same skillet add another tablespoon of oil over medium heat. Add the seasoned chicken and sauté until golden brown on each side and cook until juices run clear. Remove from pan and cool slightly; then cut into thin slices. Add the cooked chicken to the pan with the bacon and stir to combine. Next, add the spaghetti and the cream mixture and toss over medium-low heat until the chicken is heated through and the sauce coats the pasta thickly, about 4 minutes (do not boil or you might end up scrambling the eggs). Season the pasta, to taste, with pepper and salt if needed (the bacon will likely add all the salt you need). Transfer the pasta to a large wide serving bowl and serve. OH MY 2 and a half cups of whipped cream! Of course, sounds delicious, but I am just too cheap. Saving this for a company coming recipe. Then i splurge! But, I agree, a carbonara sauce is a recent find of mine as well. And delicious with the bacon! Hello there Joelen! This is another fantastic recipe! My mom really liked it! Thanks for sharing this wonderful recipe.